Visiting the different fishing ports in Pays Bigouden allows us to understand a major part of local history. Although fishing in Ile-Tudy and Sainte-Marine disappeared earlier on in favour of other south coast ports, the history and charming maritime heritage live on. The first Fisherman’s Rest (Abri du Marin) in France and the slipway make it easy to imagine the harbour full of sailing vessels in days gone by. The narrow lanes and small, sheltered harbour of Ile-Tudy, by the estuary of the Pont l’Abbé River, were once a stopover point for boats before sailing upriver to the heart of the town. The port of Pont l’Abbé with its bridge with houses on, towpath, mills and storage depots show the importance of river traffic prior to the 1950s. The south coast of Pays Bigouden is interspersed with legendary ports which are still working today. Le Guilvinec and Saint-Guénolé are symbols of Breton fishing throughout the whole of France. Loctudy remains, as always, the langoustine capital. Fresh fish is still landed daily at Lesconil as the port gradually turns more towards pleasure boating. Léchiagat is an open-air shipyard to see trawlers at close quarters on the quayside for repairs and painting ! Visiting the fishing ports is also an opportunity to go shopping for rubber boots, striped jumpers and nautical decorative objects in the specialised shops by the harbour in each of the ports ! Le Guilvinec needs no introduction ! Visitors come from all over the world to experience the hustle and bustle of the coastal fishing boats returning to harbour to land their catch at 16.30 every day. Dockers unload boxes of wriggling langoustines monkfish, pollack, hake and crabs. Lots of ideas for supper ! Le Guilvinec is the number one port for non-industrial fish landings in France ! The best place to watch the boats coming in and landing is from the roof of the fish-market. 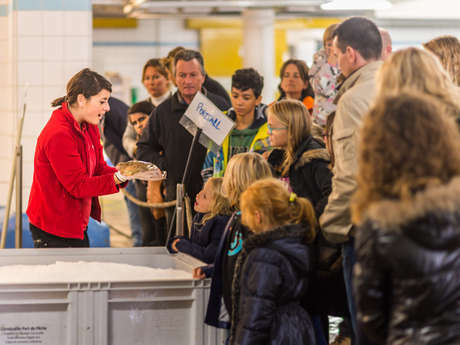 To learn more about the subject, there are guided tours of the fish-market and auction (at 05.30 or 16.30) as well as exhibitions at Haliotika Fishing Discovery Centre about the job of being a fisherman, life at sea and the journey fish takes from the sea to our plates. - Discover the number one sardine port in France – Watch the fishing boats coming in at 16.30 and visit the fish-market and auction – See sardines being landed very early in the morning, depending on the season – Visit "Océane Alimentaire" and "Comptoir de la Mer" fish canneries (guided tours and shops) – Eat and enjoy a view of the sea in one of the harbourside restaurants. 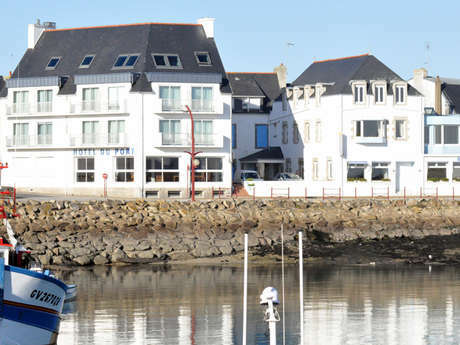 - Buy fresh fish direct from the boats at 10.30 or 16.30 – Visit the restaurants, bars and shops overlooking the harbour – Watch the waves crashing over the breakwater on windy days – Visit the Marinoé shop and taste their products made from seaweed grown, harvested and processed in Lesconil. - Discover the heritage port of Kérity and its 16th century ship owners’ houses, which symbolised its prosperity – Stroll, cycle or quadricycle between the two harbours – Visit the maritime discovery centre and exhibitions in the old lighthouse – Climb to the top of Eckmühl lighthouse – Enjoy the sea views from the pavement cafés and restaurants in Kérity and St-Pierre – Buy local fish from the fishmongers by the harbour at Kérity.